29 trucks showed up for the event. I managed to hit six, four of which I hadn't visited before. My first stop was the Shrimp Pimp. I was relieved to see that this truck took credit cards, since upon entering the event, I'd suddenly realized that I was carrying only six dollars in cash. One of the Shrimp Pimp's catchphrases is "Shrimpin' ain't easy." Say this to most people and you'll get a laugh out of them. I hoped their food was as good as their sense of humor, and I wasn't disappointed. I got a drunken shrimp taco ($3). 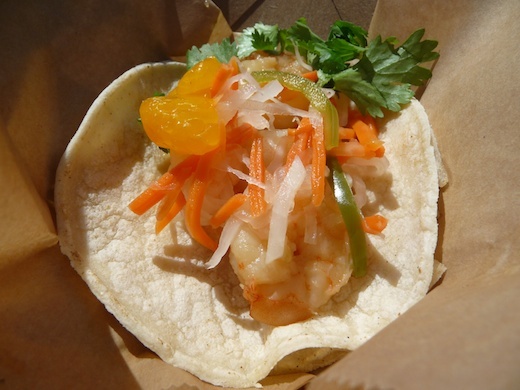 The shrimp was marinated in sherry and ginger, then sauteed and thrown in a taco with daikon, carrot, cilantro, slivers of green bell pepper and orange slices. There were about five shrimp in the taco. I'd expected them to taste more boozy, given their moniker, but they had a very light, fresh flavor. Next, I joined my husband and son at Get Shaved, where my son was already face-deep in a cup of pink lemonade, strawberry and mango-flavored shaved ice (it's $3 for a small container). 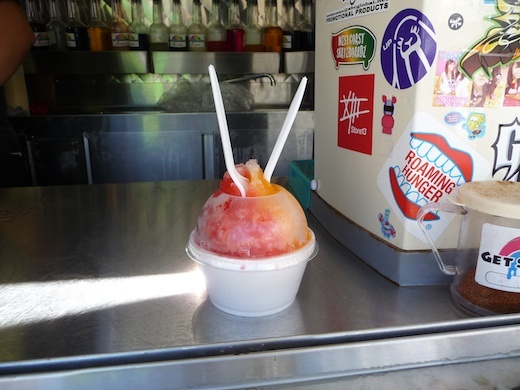 It was very tasty, if a tiny bit syrupy for my liking: I think that was because my son couldn't quite eat it fast enough (or that it was ridiculously hot outside), and by the time I got a substantial bite, it was more like shaved-ice soup. I saw the flavor "tiger's blood" on the menu, and wondered what it was: my husband asked the Get Shaved folks, who told him that it's a combination of watermelon, strawberry and coconut. 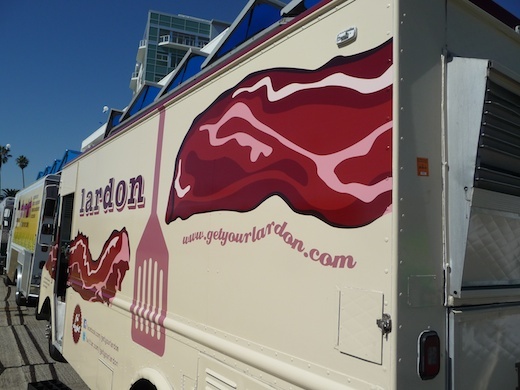 Lardon was my husband's truck of choice for his late lunch/early dinner. 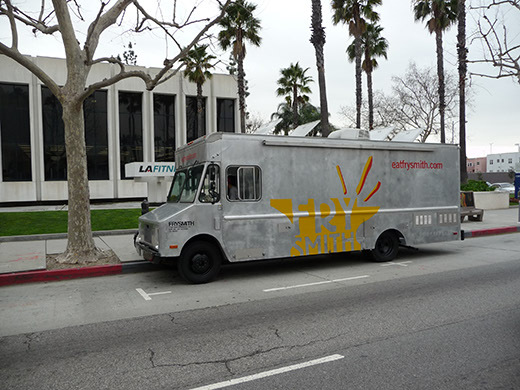 It's a bacon-themed truck that's only been on the road since September 20th. He got a Baco (I'm assuming it's a portmanteau of bacon and taco, in which case it probably should be pronounced so that it rhymes with "wacko"), a hard-taco-shaped bacon shell filled with potatoes and cheddar cheese. ZOMG that thing was good! The bacon wasn't at all greasy - it was perfectly crispy, and the crunch gave way to the delicious home-fry-style potatoes and molten cheddar inside. There was also horseradish bacon sour cream for dipping. I only got a few bites of the Baco, so I was still hungry, and intrigued by the Dim Sum Truck's new wrap (new since the last time I saw it, anyway). 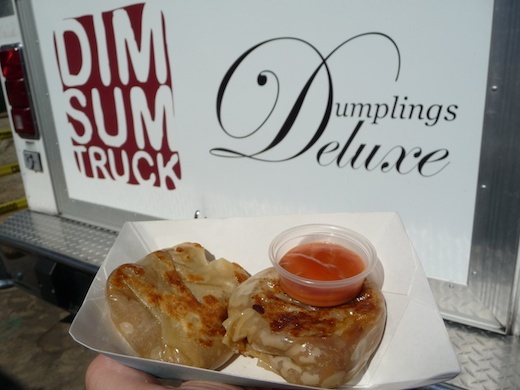 In addition to the regular Dim Sum logo, the words "Dumplings Deluxe" were written on the side of the truck in elegant script. 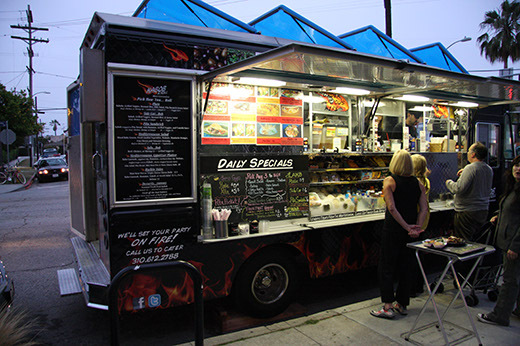 After doing a bit of research, I discovered that Dumplings Deluxe is sort of a spin-off project of the Dim Sum Truck's. 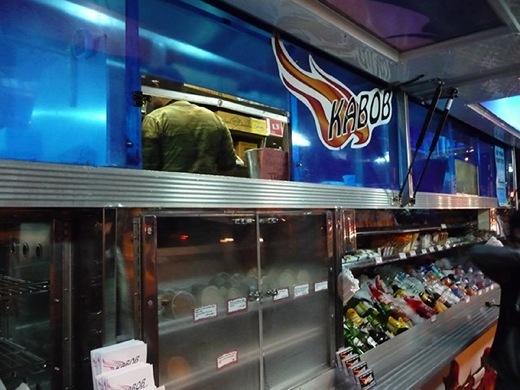 "Look forward to new dumplings inspired by different cuisines from around the world," the web site says: right now, the truck is offering American-inspired dumplings like baked potato and cheeseburger. I tried the cheeseburger dumplings (2 for $3.75): they were pan-fried and filled with ground beef, American cheese and grilled onions, with a side of ketchup for dipping. The menu claimed they came with garlic aioli (and indicated that the ketchup was actually inside the dumpling), but the dipping sauce I got was most definitely a gourmet ketchup. It was really good, so I can see their reasoning if they decided to offer a different dipping sauce than the one listed on the menu. A friend had recommended the dumplings, and, after tasting them, I will trust every piece of advice this man gives me from now on. I wanted more as soon as I'd finished them. They were f'ing amazing - doughy and juicy and cheesy. As my belly's last hurrah, I got a banana hazelnut cream puff ($3.50) from Morsels Baking Co. The banana pudding on the bottom layer of the puff was phenomenal, and made me wish I just had a bowl of it instead of the cream puff. The rest of the puff was decent, but the pastry felt a bit dry, and the cream wasn't quite airy enough. Morsels also has a fresh strawberry puff - I think the pastry would be better if it soaked up a little strawberry juice, so maybe I'll try that one next time. I still ate the whole thing. My friend - the same one who recommended the cheeseburger dumplings - wanted to visit Ahn Joo. My husband and I had had their kimchee citrus pork and roast fuji apple skewer (two for $3) before, and thought it was delicious, so we recommended it to my friend, who got it in addition to the salmon and scallion skewer with Korean miso honey (also two for $3). He offered me a bite of the salmon skewer. While it was tasty, I had one hell of a time biting through that scallion: I eventually gave up and handed it back to my friend, teeth marks and all. Also, I would have liked a stronger miso flavor - the salmon was fresh and perfectly cooked, but without a more distinctive flavor, it was just a really good piece of fish, and nothing particularly special. Looking down at my belly as I type this entry, I see that all this food has made me appear to be about four months pregnant. I would say that I'm going to take it easy for a few days, but I know you, my loyal readers, are counting on me to visit more trucks and report on all the noms they have to offer. I won't let you down. 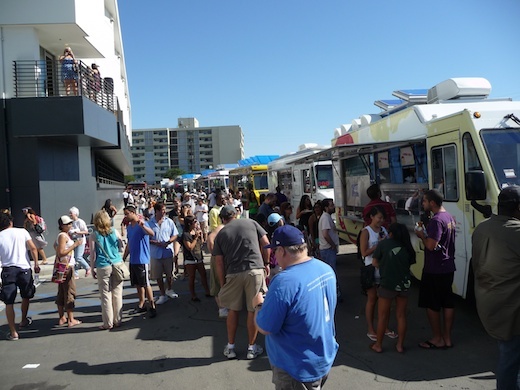 "Due to unforeseen circumstances, MUNCH LA regretfully has to cancel its event on Saturday, September 18th, 2010. MUNCH LA deeply apologizes to our supporters for any inconveniences and we hope to reschedule our event soon." 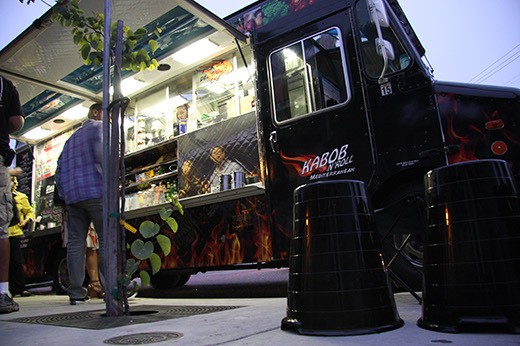 Munch LA has kindly given us two tickets to its Fairfax High food-truck and fashion event on September 18 from 11AM-5PM, and we're giving them away to one lucky reader. 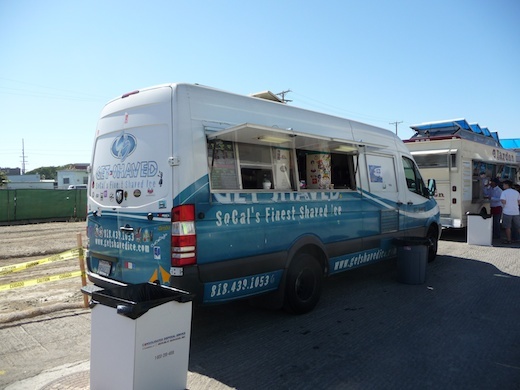 Just leave a comment below telling us your favorite food truck that will be at Munch LA, and your favorite menu item from that truck. We'll randomly select a winner on Tuesday, September 14. We'll get in touch with you via email to tell you that you've won, so be sure to include your name and email address in your comment. If you're the winner, please reply to our email within 24 hours, so we know you know you won - otherwise we'll have to select someone else to receive the tickets. 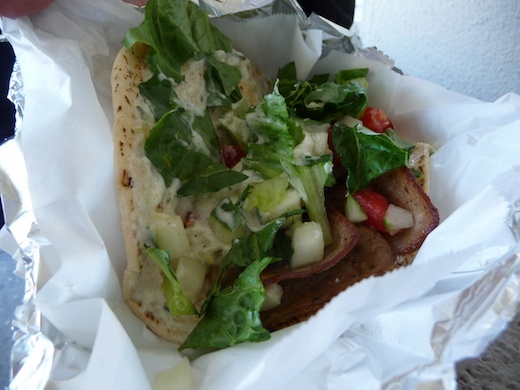 Trucks that are going to be at Munch LA include Phamish (delicious banh mi! ), Frysmith (fries with all manner of toppings! ), Lake Street Creamery (unique ice-cream flavors! ), and LudoTruck (ridiculously good fried chicken! ), plus more than 25 other trucks. Tickets to the event go for $7 in advance or $10 at the door, so if you win, you'll be getting $14-$20 worth of tickets free. Fairfax High School's address is: 7850 Melrose Avenue, Los Angeles, CA 90046. That's the southeast corner of Melrose and Fairfax Avenues. 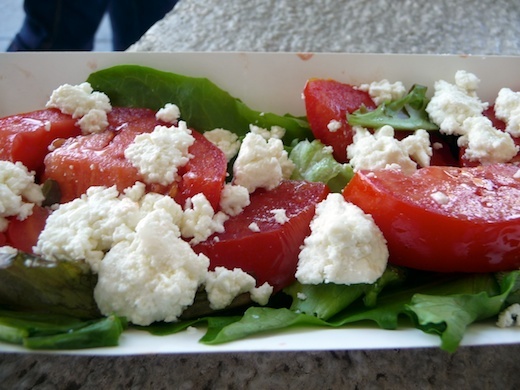 For more information on Munch LA, visit its website. We're looking forward to stuffing ourselves at Munch - we'll be sure to take our commenters' advice and fill our bellies with the menu items you like the best. And, hopefully, you'll be right there with us! 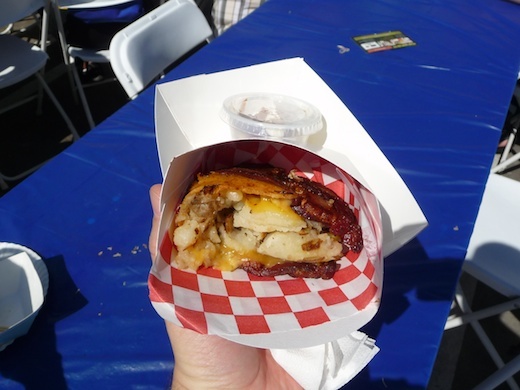 The LA County Fair starts this weekend, and this year, food trucks are going to join the festivities. For the next five weekends, the Fair will host up to two trucks a day. First up: Calbi and Coolhaus on Saturday, September 4; Calbi and Frysmith on Sunday, September 5; and Border Grill and Lake Street Creamery on Labor Day. For the four weekends after that, the trucks'll be there on Friday, Saturday and Sunday. The LA County Fair opens on Saturday, September 4, and runs until Sunday, October 3. It's at the Fairplex in Pomona, about 50 miles east of LA on the 10 Freeway. Admission for ages 13 and over is $12 on weekdays, $17 on weekends. Kids under five get in free. The Fair has tons of attractions, including Our Body: The Universe Within; ice carving exhibitions; horse racing; a traveling circus; and the Extreme Canine Stunt Dog Show. You can shop for anything from a Whoopie Pie to hand-blown glass to emergency preparedness kits.